Vincent Fort describes himself as an “agitator” who wants to stop gentrification and expand affordable housing in Atlanta. Photo courtesy of the Fort campaign. From Texas to Florida, voters are supporting candidates across the broad spectrum of the left: progressive Democrats and committed socialists who want to reduce wealth inequality, return power to workers, and chip away at structures of oppression. On a warm evening in September, Vincent Fort rose from his pew at Saint Philip AME church in Atlanta, and lifted a clenched fist into the air. Claps and hollers tore through the packed assembly. “I didn’t often get this kind of reception when I was down at the State Capitol,” Fort boomed, as hundreds of supporters, including Vermont Senator Bernie Sanders, cheered. It’s not hard to imagine why his reception at the Capitol was chillier. For over two decades, the 61-year-old state senator has been an outspoken progressive in the Republican-controlled Georgia state legislature. Now, Fort is running for mayor of Atlanta. He spends his days talking with people who, like him, want to transform the most unequal city in America into a place where working people are given priority. Fort’s platform is as ambitious as his rhetoric. He wants to raise the city’s minimum wage to $15 an hour, decriminalize marijuana, guarantee two years of tuition-free college for high school graduates, and expand the city’s aging rapid transit system. As a state senator, Fort pushed similarly progressive proposals through the legislature, including a 2002 anti-predatory lending law considered the toughest of its kind at the time. But he says he’s ready to jump back into more local affairs. To win, Fort will have to out-campaign his more moderate opponents. Mary Norwood, a city councilwoman who’s widely favored to win, has a history of focusing on neighborhood-level problems rather than big-picture issues, like race and class inequality in the city. Keisha Lance Bottoms, a city councilwoman who’s also considered a major contender, shares some of Fort’s goals (including raising the minimum wage to $15), but casts herself as a centrist: she’s a proponent of affordable housing, but also a friend to police and corporations. A flock of other contenders, none as progressive as Fort, are also jockeying for the spot. Fort, by contrast, sees himself as an outsider and a populist. “If you want to elect an agitator, you just found one,” Fort told supporters in September. 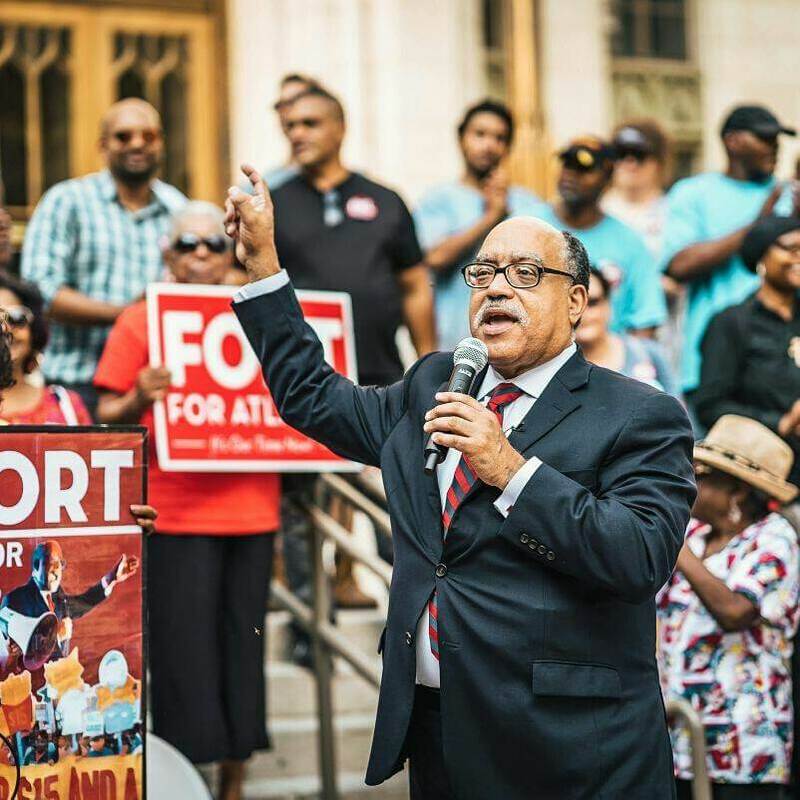 And while he doesn’t describe himself as a socialist, Fort aligns himself with Bernie Sanders and has been endorsed by the Metro Atlanta Democratic Socialists of America. Besides, he says, policies are more important than “verbiage.” “Political rhetoric follows changes in people's ideas,” he said. Fort’s vision for Atlanta is in step with changing political attitudes in the South. From Texas to Florida, voters are supporting candidates across the broad spectrum of the left: progressive Democrats and committed socialists who want to reduce wealth inequality, return power to workers, and chip away at structures of oppression that have kept people of color, women, LGBTQ folks, and others from wielding economic and political control. A handful of candidates have already shown that winning is possible. In July, thirty-four-year-old Chokwe Antar Lumumba clinched the mayor’s race in Jackson, Mississippi, after promising to make Jackson “the most radical city on the planet.” In October, thirty-six-year-old Randall Woodfin was elected mayor of Birmingham, Alabama on a platform that included guaranteeing debt-free college and investing in minority-owned businesses. And back in April, khalid kamau won a city council seat in South Fulton, Georgia as a member of the Democratic Socialists of America. Still, it remains to be seen whether these candidates are anomalies or omens, flashes in the pan or portents of a changing region. “There’s a progressive resurgence in the South,” said Nina Turner, a former state senator from Ohio and president of a new political organization called Our Revolution. Our Revolution, which spun out of Sanders’s presidential campaign, is one of several national organizations supporting progressive candidates for local office. "I think we were sold a facade of utopia, a facade of the American dream"
Several progressive candidates, including Fort, will have a chance to prove their viability on November 7. Liliana Bakhtiari, a queer woman of Iranian descent, is running for city council in Atlanta. And progressive Uriah Ward is angling for a council seat in Greenville, North Carolina. Both have been endorsed by Our Revolution. Martin Ramsey, a socialist who cut his political teeth during the Occupy movement, is running for mayor in Asheville. His expansive platform, which has been endorsed by the city’s fledgling DSA chapter, includes raising city workers’ wages, expanding affordable housing, and introducing fare-free public transit. This isn’t Ramsey’s first campaign. When the thirty-five-year-old food service worker first ran for mayor, back in 2013, he didn’t receive enough votes to clear the primary. This time, nearly 2,000 people voted to push him into the general election. What’s different now? “I feel like the mood in the country has changed a little bit,” Ramsey said. He added that progressive victories in Mississippi and Alabama inspired him to run again this year. Martin Ramsey, who’s running for mayor in Asheville, NC talks on the phone with the author at his home in Asheville. Socialist ideas are more popular in America today than they’ve been since the 1960s. A majority of young Americans reject capitalism, according to a 2016 survey, and nearly two-thirds of Americans support universal health care, a major priority of the left. While no single event can account for an apparent renewed enthusiasm for socialism, the 2008 financial crisis, which devastated working-class families, revealed an ugly truth about American capitalism: unregulated markets tend to enrich corporate elites at the expense of ordinary people, their communities and environments. Occupy Wall Street, which sprung up in 2011, reintroduced class into mainstream political analysis, and gave Americans a vocabulary — wealth inequality, economic justice, the 99 percent — to articulate the condition many had come to inhabit. Bernie Sanders’ 2016 presidential campaign shot issues like universal health care and wealth redistribution into the national debate, and energized millions of Americans. Sanders shook off the dirt conservatives had dumped on socialism for decades, and polished it into a usable, if imperfect, word. The eventual election of Donald Trump, far from killing the American left, provoked ferocious opposition from leftists. Since the 2016 presidential election, groups like the Democratic Socialists of America have swiftly gained members and visibility. And left-leaning candidates, from open socialists to left liberals, have begun to win elections in cities beyond the South, too. For long-time Durham activist Lamont Lilly, this new enthusiasm for socialist ideas reflects young people’s frustration with the failures of liberal capitalism. Some progressives see southern cities as bulwarks against revanchist state and federal governments who are advancing conservative agendas at a breakneck pace. “In the era of Trump and right wing control of state legislatures… the local government is all the more important,” Fort said. Fort says cities like Atlanta should stop offering subsidies to wealthy developers, and instead commit to building affordable housing in areas, like Atlanta’s Westside, where over 40 percent of residents are poor. Southern states have some of the highest poverty rates in the nation. And while southern poverty is often associated with truck stops and trailer parks, the region’s poor are concentrated in urban areas and are disproportionately black and Latino. For them, escaping poverty is harder than anywhere else in the country. Cities like Charlotte, Nashville, and New Orleans have some of the lowest rates of social mobility anywhere. Atlanta ranks number one in social immobility, and is one of the fastest gentrifying cities in the country. While city governments can’t solve these problems alone, local officials have considerable power. Municipal governments make decisions about affordable housing, property taxes, and municipal wages (although several states, including Louisiana, Georgia and North Carolina, have forbidden cities from setting their own minimum wage requirements). In many places, city governments also control municipal police forces and run schools. But cities are imperfect sites of political resistance. Bruce Anderson, political scientist at Florida Southern College in Lakeland, Florida, says city voters tend to elect candidates who promise to tackle the persistent, day-to-day problems of urban life. Politics at the city level is often about “dealing with potholes and sewers,” Anderson argues. Most voters are more concerned about garbage disposal than grand visions of economic change. And there’s the problem of winning the election itself. “The short story is not many progressives are elected in the South,” he said. Ramsey, too, worries about the limitations of city government, but he doesn’t think leftists should abandon electoral politics. "Don’t give up, and organize like hell"
Pierce Freelon knows what it’s like to run, and lose, as a progressive candidate in a southern city. The thirty-three-year-old rapper and self-described “Afro-futurist” jumped into the race for mayor of Durham, North Carolina last April. While his most serious opponents also supported progressive agendas, Freelon outlined a singularly radical vision for a southern city. He proposed a “jobs for all” program that would guarantee everyone in the city decent paid work. And he vowed to increase the city’s affordable housing stock, pass an anti-discrimination ordinance, end money bail, and turn Durham into a sanctuary city for immigrants. Young progressives loved him. During a candidate’s forum at a local dive bar in September, Freelon quoted Angela Davis, rapped, and suggested the country should abolish prisons -- all to the delight of the mostly young, mostly left-leaning audience. Other candidates were there. But they were wallpaper. And yet, despite whipping up excitement among Durham’s leftists, Freelon’s ambitious platform wasn’t enough to push him through the primary in October. The lesson he took away from his failed bid? Don’t give up, and organize like hell. Pierce Freelon, who ran unsuccessfully for mayor of Durham this year, works at his studio, Blackspace, in Durham, NC. The south boasts a long history of grassroots political organizing. Fort, who has been arrested several times for civil disobedience, says it’s important to remember how activists from abolitionists to Civil Rights groups have laid the groundwork for contemporary struggles for economic and racial justice. The Sanders campaign may have energized young people, Fort says, but grassroots organizations have been building power in the South for decades. “It’s not as if we haven’t been doing anything,” Fort observed, citing his work as a community organizer in the 1990s, and his role in the successful effort to shutter Atlanta’s Live Oak landfill in 2003. Fort recently sat down with another activist, rapper Killer Mike, at the Swag Shop in Atlanta’s Old Fourth Ward neighborhood. As the two men settled into red vinyl barber chairs, they faced each other as emissaries from two generations of black progressive organizing. Behind them, framed by a plate-glass window, pedestrians milled up and down Edgewood Avenue. Once a center of black life in Atlanta, the street now reflects the urban architecture of white hipsterdom: barcades and beer gardens flank the avenue; fixed-gear bicycles gleam in a nearby storefront. Casey Williams is a writer based in Durham, NC. He covers issues from environmental justice to southern culture, and has published work in The New York Times, The Nation, HuffPost, and other local and national outlets.